My favourite discoveries of the year so far! I cannot believe that it is June already - this year really is flying by! 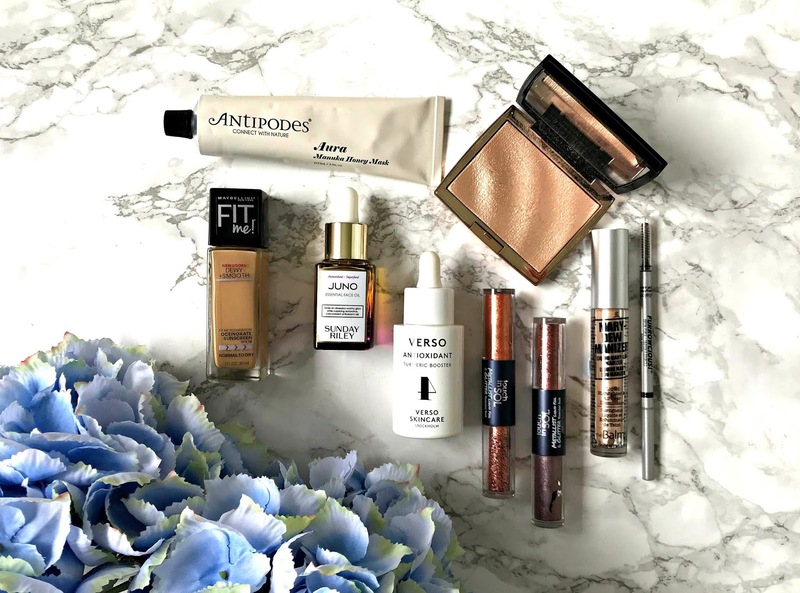 I like to do a mid-year check in with my beauty products and see what has really stood out to me over the past six months. As you can imagine, I try a lot of products so any that make it on to the list really have to be impressive! Surprisingly, I have more makeup than skincare products in this list but I guess that's because I have a good number of staples in my skincare routine so it takes a lot for something to overtake those. Verso Turmeric Booster: I raved about this a few times on the blog (see Verso post here) - it's a gel-like serum that instantly soothes and calms the skin, toning down any redness and inflammation. With continued use, skin is firm, plump, bright and strengthened. Expensive but worth the money! Antipodes Aura Mask: Another product that I have raved about previously - this mask soothes, plumps. heals and hydrates my skin. It is ideal to use after an exfoliating or mud mask to restore balance. All skin types would benefit from this mask. Full review here. Sunday Riley Juno Oil: I love a good face oil but this is not just good - it's amazing!! It adds a glow unlike any other oil that I've tried and a little goes a really long way with it. I can use it morning or night and the combination of Omegas 3, 6 and 9 and Vitamin C with amino acids means that my skin is nourished, bright and calm. If you have dry, dull or lacklustre skin, I urge you to try this oil. Maybelline Fit Me Dewy & Smooth Foundation: I adore the radiant finish of this foundation with medium coverage. My skin looks even, poreless, smooth and glowing when I use it and it's long-lasting on the skin too. I've been reaching for it more than any of my high end bases over the last few months. Anastasia Beverly Hills Amrezy Highlighter: The gel-powder texture of this highlighter is so easy to work with and it is actually less blinding than it looks in the pan so it can be used on a daily basis without running the risk of looking like the tin man from the Wizard Of Oz. However it can also be layered to build up intensity if you so wish. I also love the packaging and the design on the product itself. 10/10! theBalm Mary-Dew Manizer: Another highlighter but this time, it's a liquid product. I have really fallen in love with quite a few products from theBalm this year but this and the brow pencil have really stood out to me. This has the same flattering pale gold shade as Mary-Lou Manizer and it has a beautiful texture that is easy to blend into the skin without disturbing the base underneath. Liquid highlighters really suit my dry skin and this one in particular works wonders as the texture is the perfect balance between liquid and cream. Touch In Sol Metallist Shadow Liquid Foil & Glitter Duos: Finally, I had to mention these stunning liquid shadows! Touch In Sol is another brand that I've really enjoyed exploring this year but these shadows are the standout products for me. On one end is a cream shadow with a metallic finish and on the other is a glitter. The metallic shadow can be worn alone for a quick eye look but it also creates the perfect base for the glitter to intensify the whole look. There is no falldown so my easily-irritated eyes don't need to worry about glitter particles falling into them. They are intensely pigmented and really long-lasting - there is nothing not to love! Have you tried any of these products? I would love to hear what your favourite discoveries of 2018 so far have been? Don't forget to enter my Laura Geller Face Palette giveaway here! I also have a Catrice giveaway here! 5 products I'm currently loving! My holiday hair and makeup picks! Azzaro Chrome - the perfect Father's Day gift! My top 5 cleansing balms for all skin types!